I spent my Sunday afternoon creating these sweet little favor boxes for some friends. I was randomly inspired by a flyer that was hanging on the chalkboard behind the teacher in Sunday School! LOL! I sat and looked at it and thought: Pinefeather and Saffron Spice...I'm going to have to try that! I knew that I would forget once church got out, so I quickly created a reminder in my phone. Ha ha! I'm usually inspired by someone's dress or blouse at church, but by the time I get home, it is completely wiped from my memory as the kids are begging for lunch and to be relieved of their church attire! LOL! I decided to make a little collection of favor boxes using the Favor It Box 1 Die. This die has been in my "new" basket for a shamefully long time! 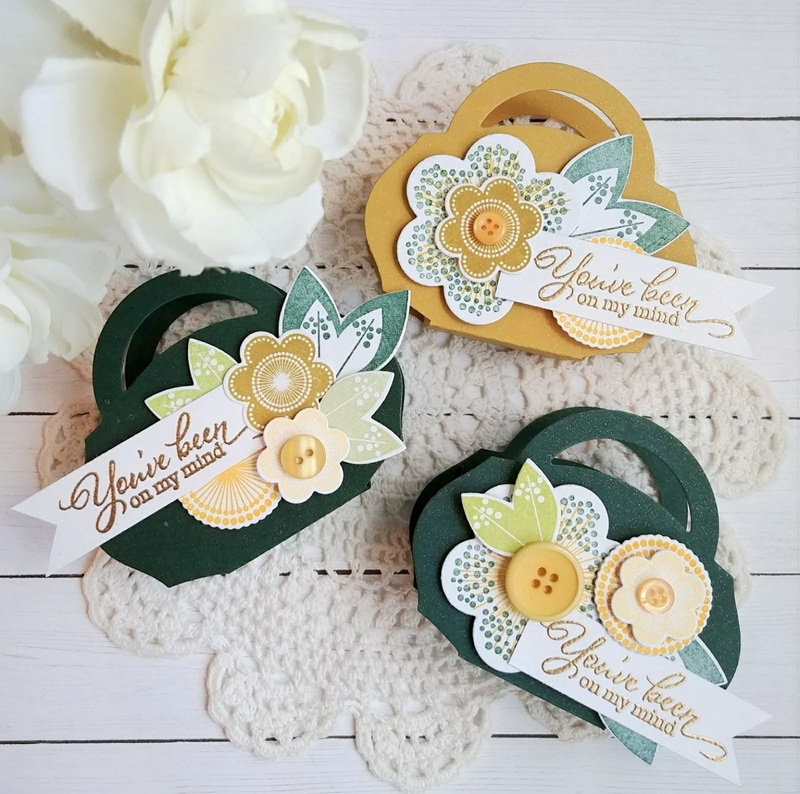 If you've been reading my recent posts, I am working my way through my unused new stamps and dies! It is so nice and I am having loads of fun! I made 7 boxes in total. You can get two favor boxes from one 81/2 by 11 piece of cardstock, which is always nice. I thought 6 was too few, but 8 too many, so 7 is was! LOL! 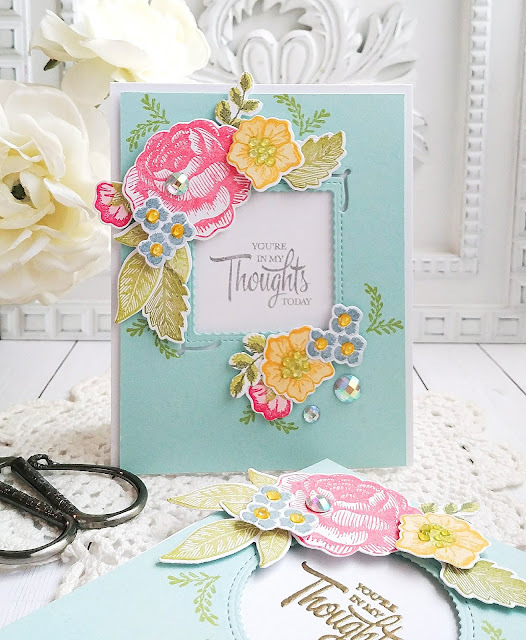 I thought that the Friendly Flowers stamp set would be the perfect set to use for this color combination, AND...I have only used this set once on THIS card, and if you read my last post, I like to use my new sets at least twice before I put them on their shelf! LOL! 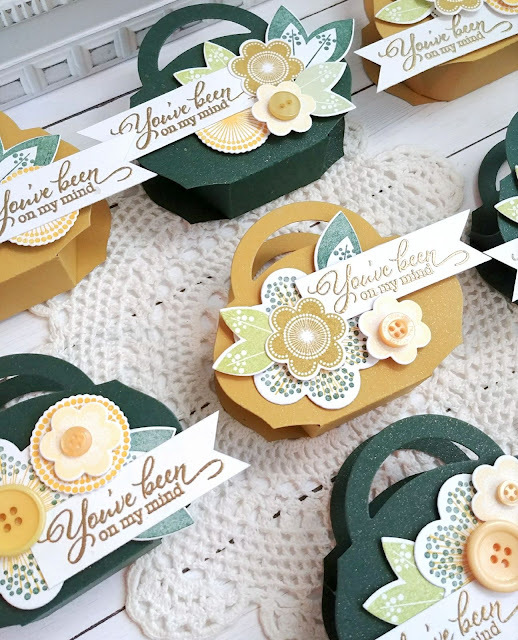 I assembled each of the boxes and then just had fun adding all of the stamped flowers and buttons. I used glue dots to add the buttons and foam squares to add to the flowers and leaves to create some visual depth and interest. 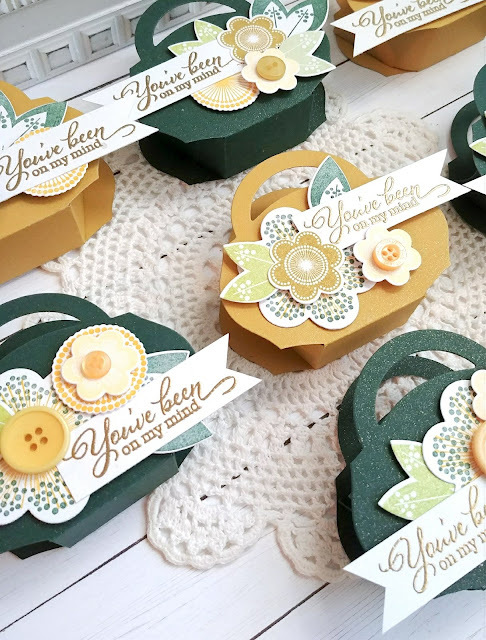 The sentiments for each box are heat embossed in gold to add to the warmth of each box. I also spritzed them with shimmer spray because I just can't resist! I'll be filling these up with some candies and some little lotions from Bath and Body Works in coordinating colors! These were so fun to make! I'm on a quest to get some ink on the new sets that I haven't used yet. Stitching Garden was one of those "must-have" sets, but once I got it, I was too busy with other things! I decided to pull it out and experiment with it for today's cards. They are both similar, yet with a few differences that I will talk about in today's post. 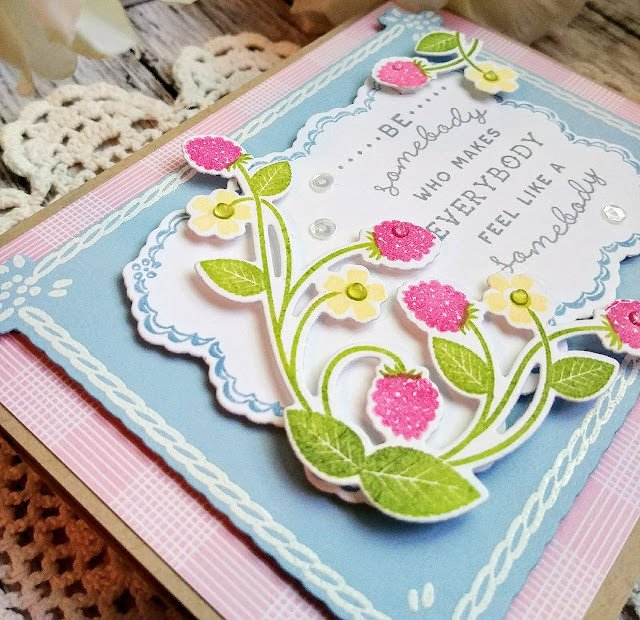 I really liked the way THIS card turned out, so I wanted to create something similar, but with the Stitching Garden set for the flowers. I also just adore the Window Works Dies! I used them the other day on THIS card. 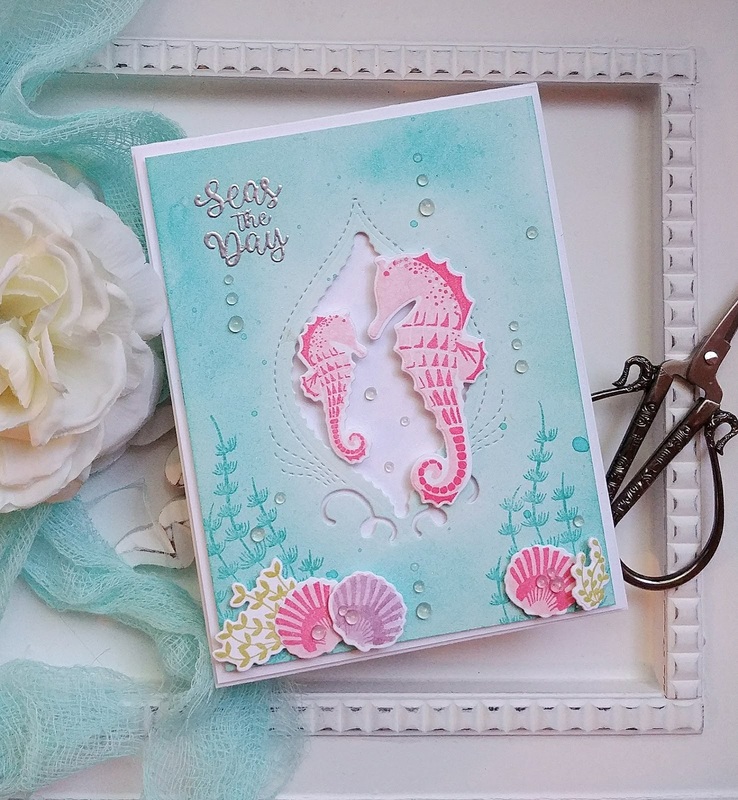 Actually, I made these two cards first, and then decided to make the Seahorse card. I knew that those little seahorses would look so sweet nestled into the window! 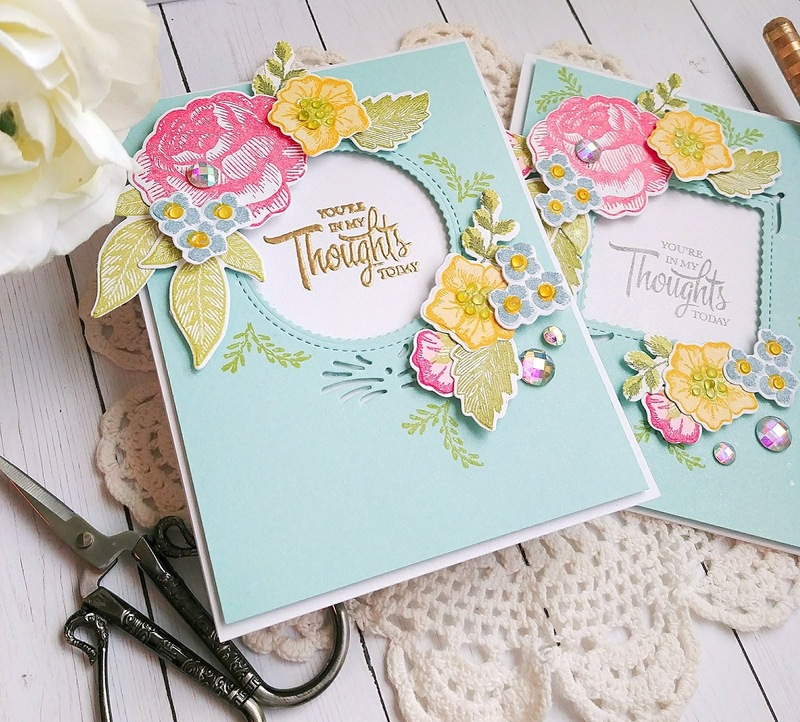 For these cards, I chose the circle and the square window openings for the two sentiments. One is stamped in Smokey Shadow ink and the other is heat embossed in gold. 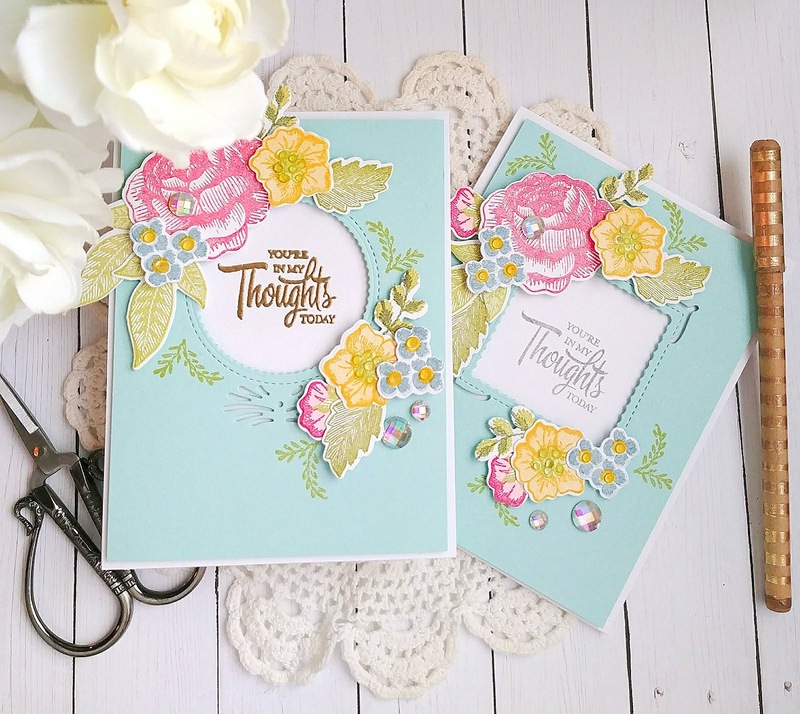 These particular sentiments are from the It's the Thought stamp set. I was anxious to use this one again so that I could take it out of the "new" basket and add it to the rest of my collection. I find that I need to use a set at least twice before I feel like it is etched in my mind and I won't catalog it and forget about it! LOL! I'm also going to do the same thing with these gorgeous florals because I don't think I could ever forget about them! When I get a new set, I find it helpful to just sit down and stamp out all of the images! Actually, the first thing I do is to check the coordinating die cuts and see if they are the wired shapes or if they are solid. If they are the wired ones, then I just get to work doing the stamping. If they are the solid dies, I do the diecutting first and then start the stamping. Oftentimes sets may have both, so it is helpful to check when starting out. I love that you can see where you are diecutting your prestamped images with the wire dies. This particular set has quite an assortment of images, leaves, and things. I didn't do the multiple step stamping on all of the images. I just had fun playing around. By the time I was done, I had quite an assortment of images. Some of the little greenery sprigs don't have dies, but it was fun to go in after I had the flowers arranged and just stamp them here and there as you can see in this photo. I might have gotten just a little bit carried away! LOL! Oh well....that is all part of getting to know a new set! 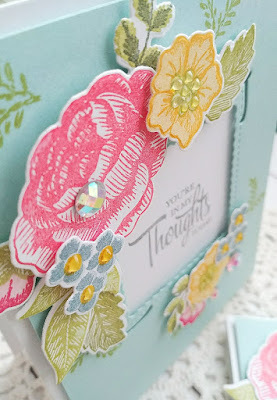 I added some clear Nuvo drops to the centers of the flowers and added a few gems here and there for some added interest. Both cards are spritzed heavily with sparkle Shimmer Spray. I'm so happy to have two "thinking of you" cards for my stash. I completely cleared that section out the other day when we went out delivering cookies! Thanks for fluttering by! Happy Monday! 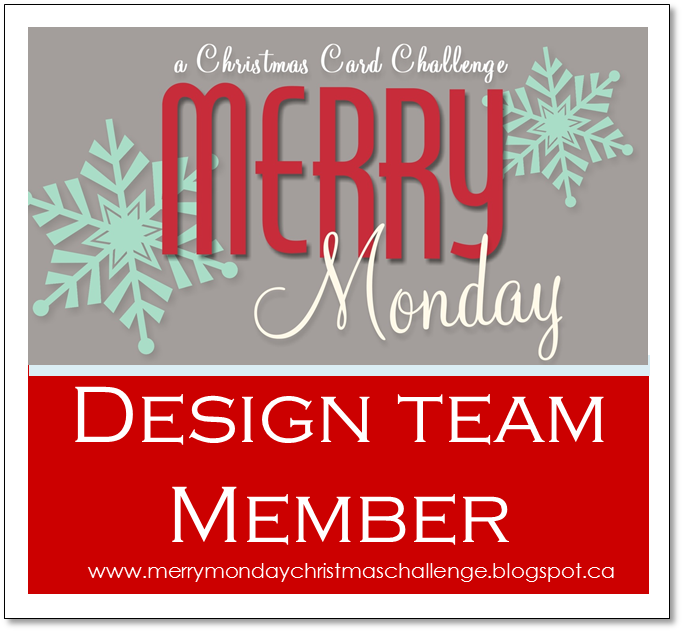 I'm here today with this week's Merry Monday Christmas Challenge !! 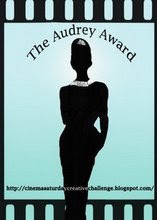 And...It is with sadness that it will be our LAST challenge as well! I'm so sad to be saying goodbye! I have thoroughly enjoyed my time on the team, albeit a short time! 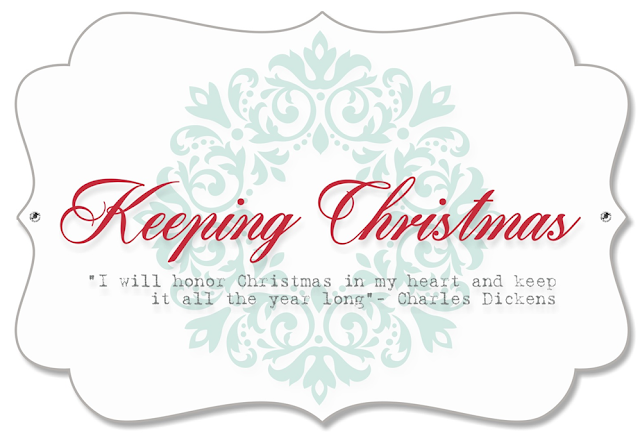 I will still be posting my monthly Keeping Christmas posts, so there will still be some Christmas around here! Ha Ha! For our final challenge, Nina has asked us to create a rustic Christmas card! This is such a fun one because anything rustic is so popular right now! Nina always uses pattern paper so well, so I thought I would use some today as well! 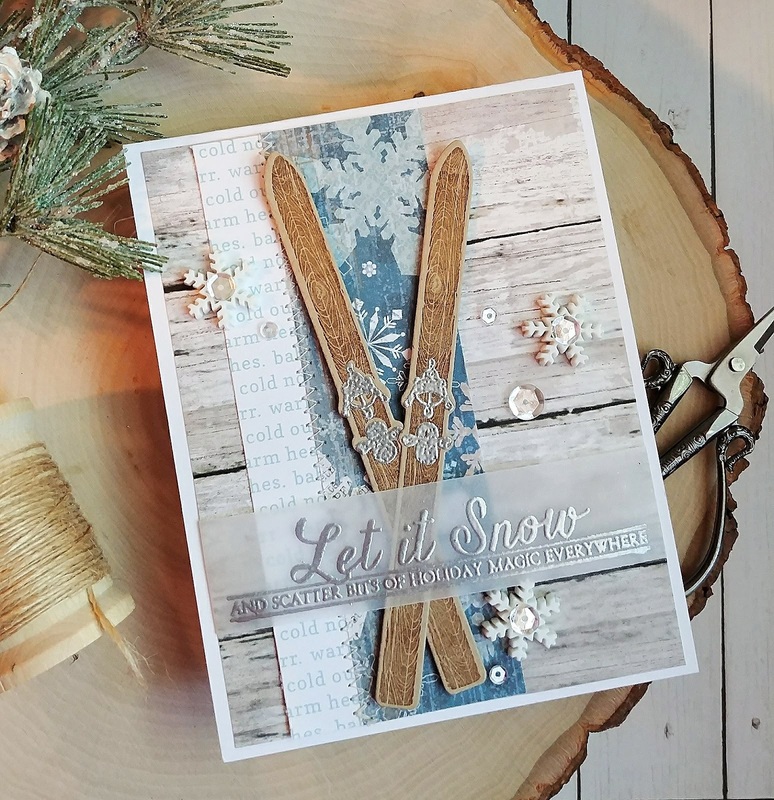 I knew that one of my favorite stamp sets, Two Feet Deep, would be the perfect choice to create my rustic design. 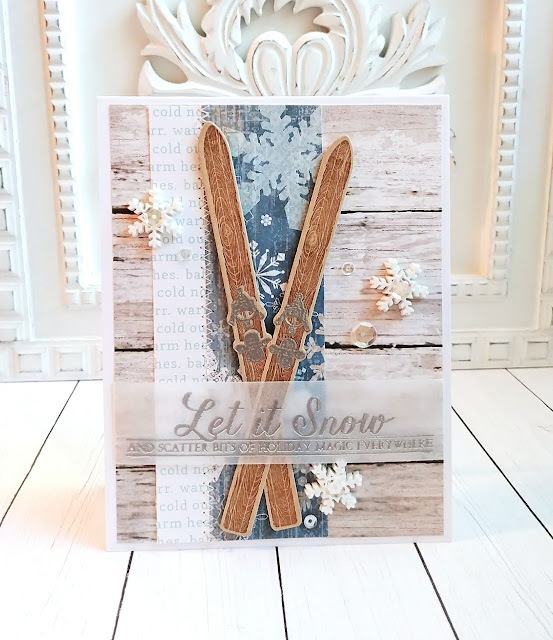 I stamped the skis using Vintage Photo Distress Ink onto Kraft cardstock. I used the coordinating Two Feet Deep dies to cut them out. I heat embossed the silver portion for some added detail and realism. The background is created by layering a potpourri of pattern papers. I just love the wood background and it is a piece of pattern paper from Hobby Lobby. I also layered up a piece of snowflake paper that is also from Hobby Lobby with a strip of paper from the Warm Hearts 6 by 6 paper pad. I did some zig zag machine stitching along the seam for some interest. The sentiment is heat embossed in silver onto a strip of vellum and wrapped around the back of the pattern papers. It was easy for me to tuck the skis down behind the vellum. The finishing touches are a few plastic snowflake embellishments I've had in my stash for a while. I added some sequins to the middle of each one as well as a few others scattered here and there for some added shine. 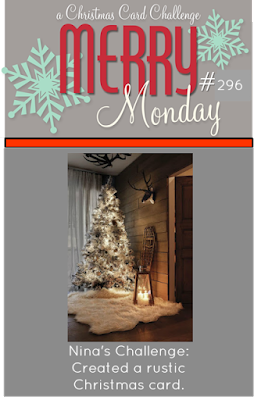 I hope you get a chance to join us for this last and final Merry Monday Christmas challenge! Thanks for fluttering by! 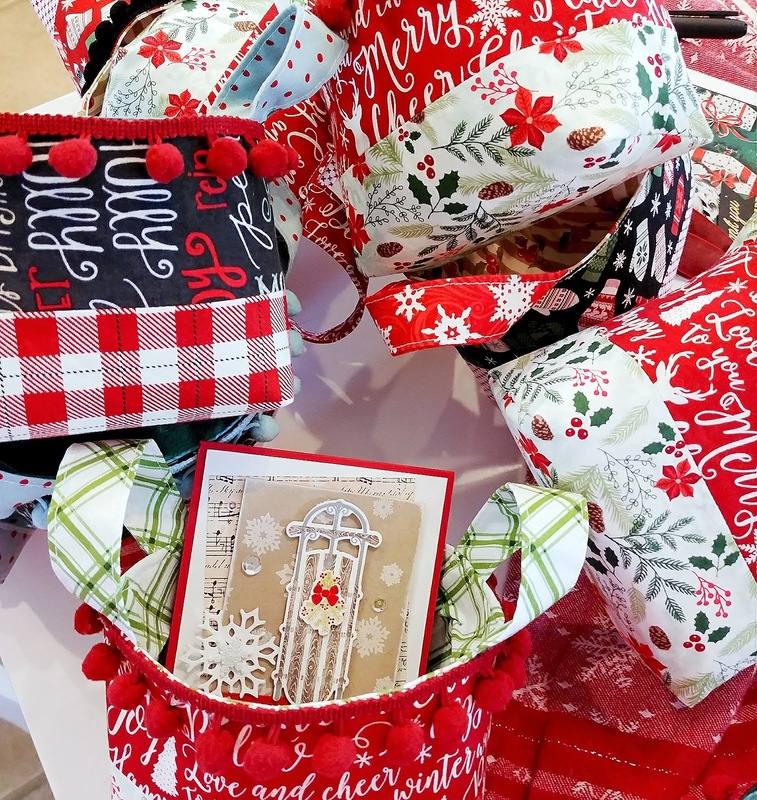 Welcome to June's installment of the Keeping Christmas Inspiration Blog Hop! Today I've got what I'm calling a "cheater project" (LOL!) because it is actually a project from this past Christmas that I never shared! My photos were last minute "on the fly" pictures so I could at least document all of my hard work, but I never really intended to share them, so please look past the questionable staging...this is real life people! 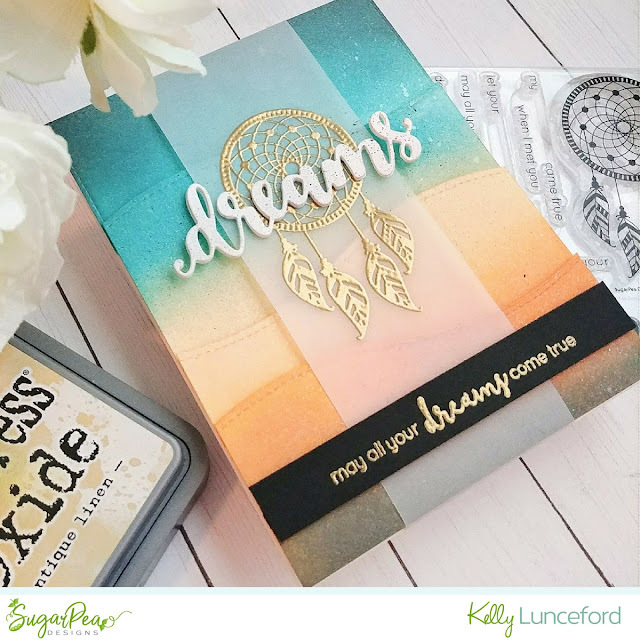 Don't forget to head to the rest of the team's blogs to see what fabulous inspiration they have for you today! 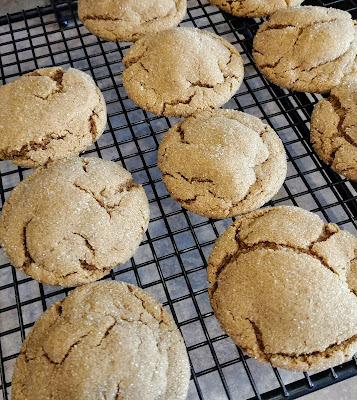 Every year I make my famous and delicious Soft Ginger cookies. 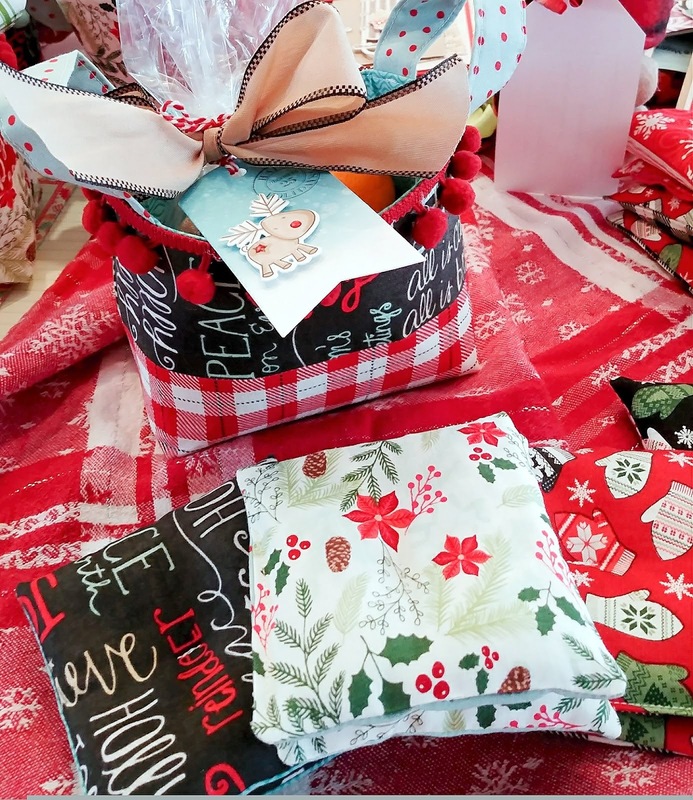 I usually package them up in cellophane bags with one of my handmade tags. You can see them in all of their delicious glory here on the cooling racks. I usually triple the recipe so that I can give them out to lots of our friends and neighbors. 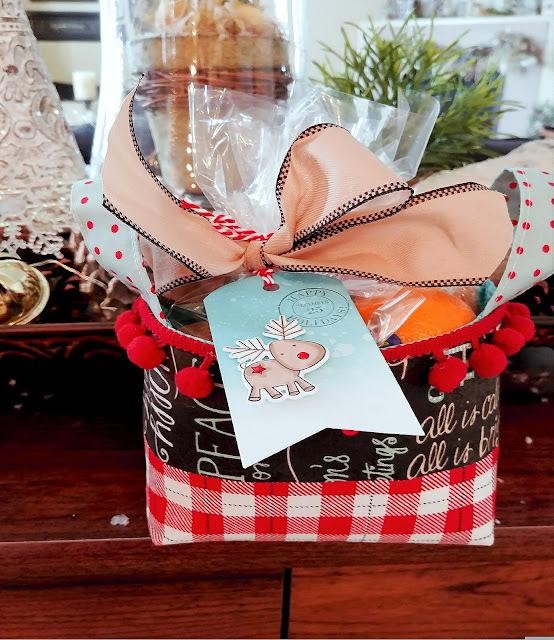 In the past I have put the cookie bags, along with my homemade caramels, jams/jellys/or lemon curd, and clementines into cookie tins or baskets. This past year I was so excited to put the treats into my Flutterby Baskets. You can read all about them over on my sewing blog Thimbles and Thread. 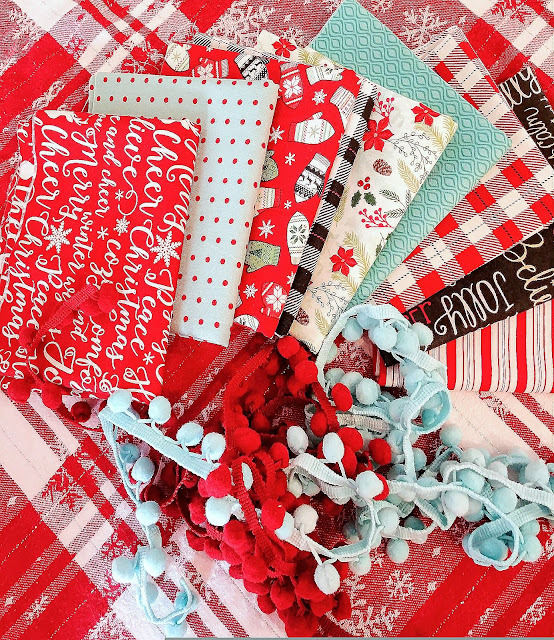 To begin, I went to my favorite local quilt shop and picked up this fabulous assortment of fabrics and pom pom trims! Aren't they so cute? Picking out fabric is just as much fun as picking out pattern paper for cards! I think when it was all said and done I made 15 baskets! Whew! I tried to make at least two of three for days on end! By the time I got them all sewn, I was cutting it close to get them all delivered WITH the homemade treats I made as well. So...that's why I ran out of time to get some properly stages photos. This is me AT the kitchen table, my neighbor list and pens out getting them all put together. Each basket also included one of the handmade cards I made last year during the year for my Keeping Christmas projects or Merry Monday. You can see one of my favorites peeking out of the basket here. Once the baskets were all made, I had leftover fabric pieces that I didn't want to go to waste, so I made some of my Handmade Handwarmers as well. They were just the thing to tuck in with all of the treats! I also had so much fun using up all of my tags that I had made during the year as well. 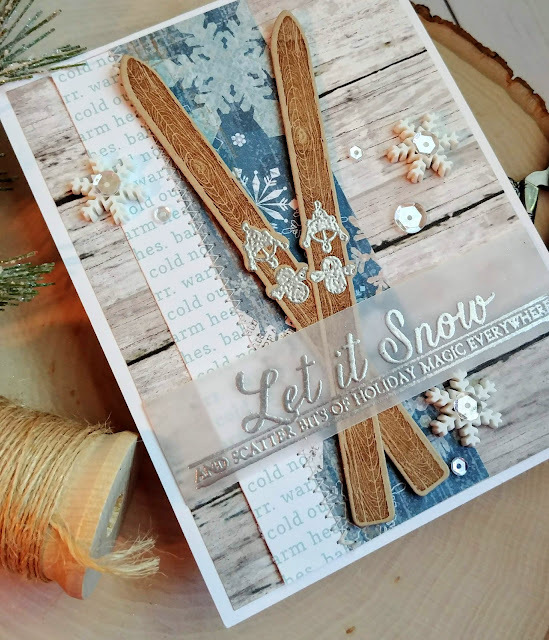 This particular one is from the 25 days of tags challenge that Tracey McNeely puts on each year! I had a ball! Thanks for fluttering by! I've been dying to get these little creatures from the new Salt Air: Fauna stamp set inked up! I wasn't assigned these particular stamps for the release and I was so busy I didn't get a chance to ink them up! They are soooooo much fun! To begin, I sponged some Peacock Feathers Distress ink onto a panel of Bristol paper. Once it was blended to my liking, I added some flecks of the same ink at full strength mixed with water. I also spritzed it HEAVILY with shimmer spray! Once that was dry, I used the Window Works Die to cut out a window. I thought that this particular die looked like a seashell or something from the sea! 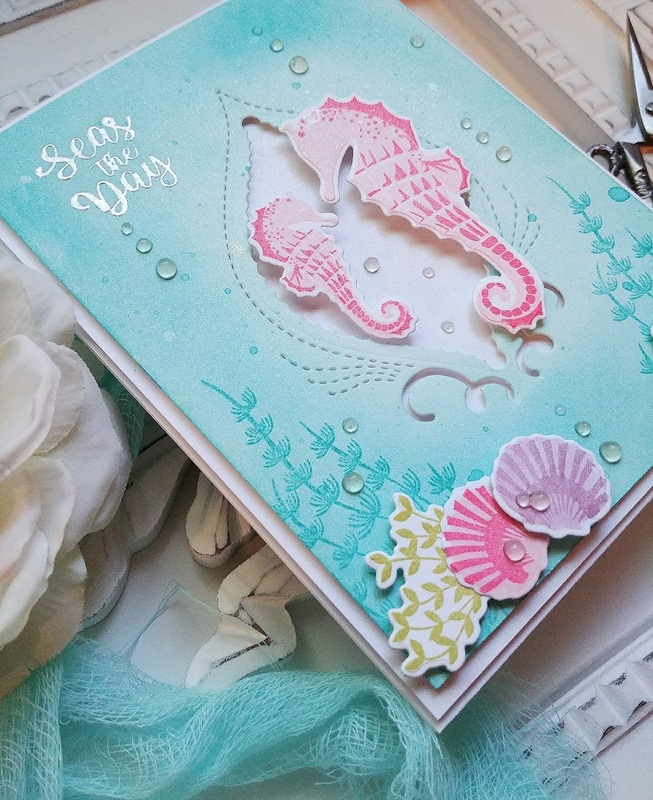 It is the perfect place to set the scene for this pair of Seahorses. I stamped them in two shades of pink for a fun and whimsical look. You can see how cute they looked nestled into the opening. I had actually used these on a pair of cards that I will be sharing soon as well, and I just wasn't ready to put them away just yet. 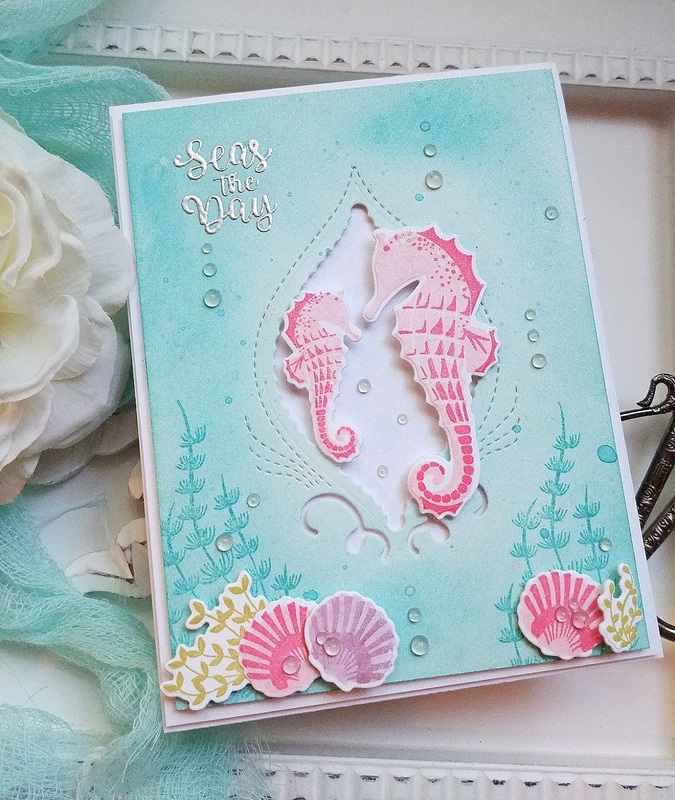 I paired the seahorses and shells from the Salt Air: Fauna set with the coordinating Salt Air: Flora stamp set. I didn't want the scene to be too busy so I chose just a few colors. 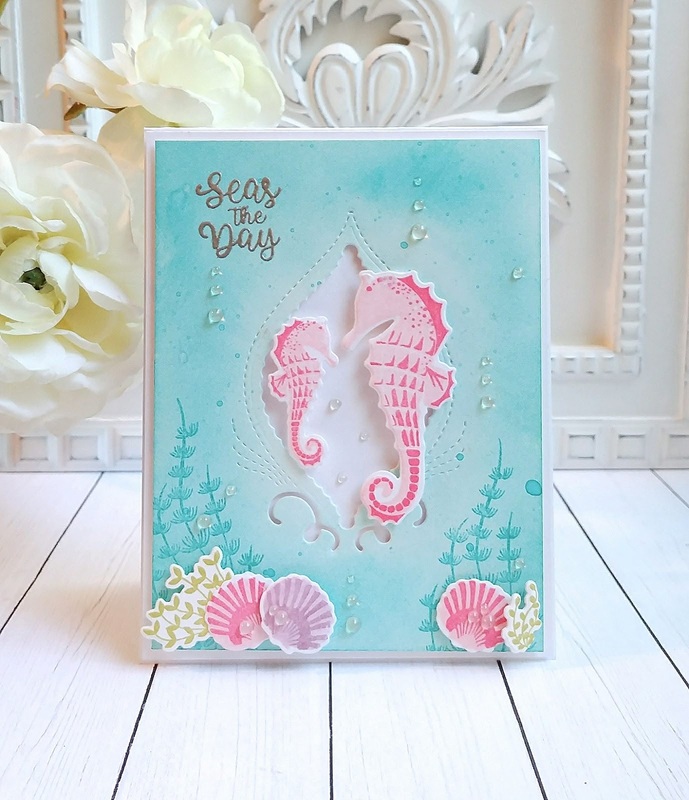 The sentiment, which is from the Salt Air Sentiments, is heat embossed in silver for some extra shine and detail. 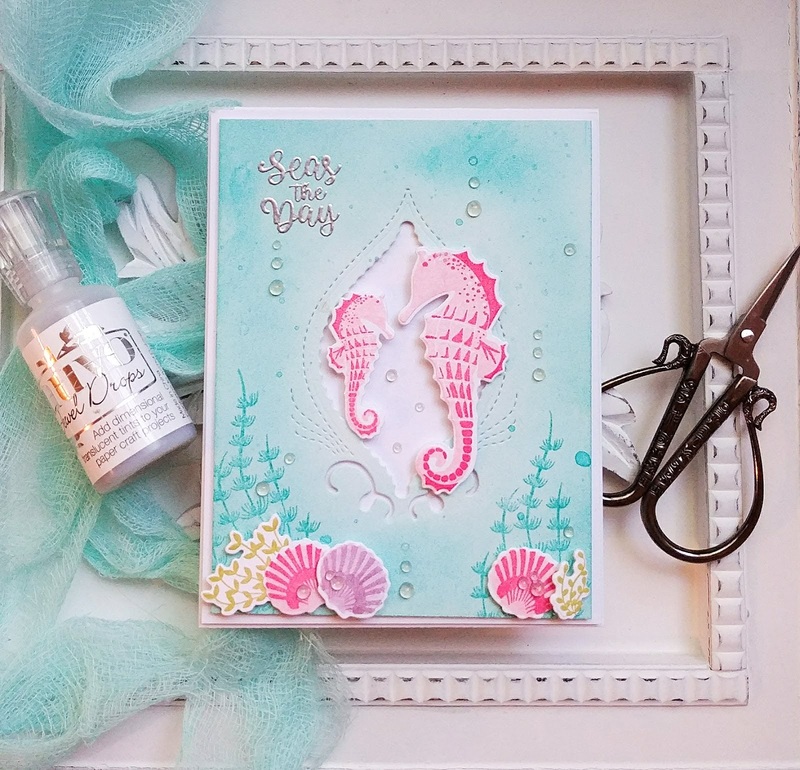 I went a little crazy with the clear Nuvo drops, but I love the detail and whimsy they add to this underwater scene! Thanks for fluttering by! Welcome friends! 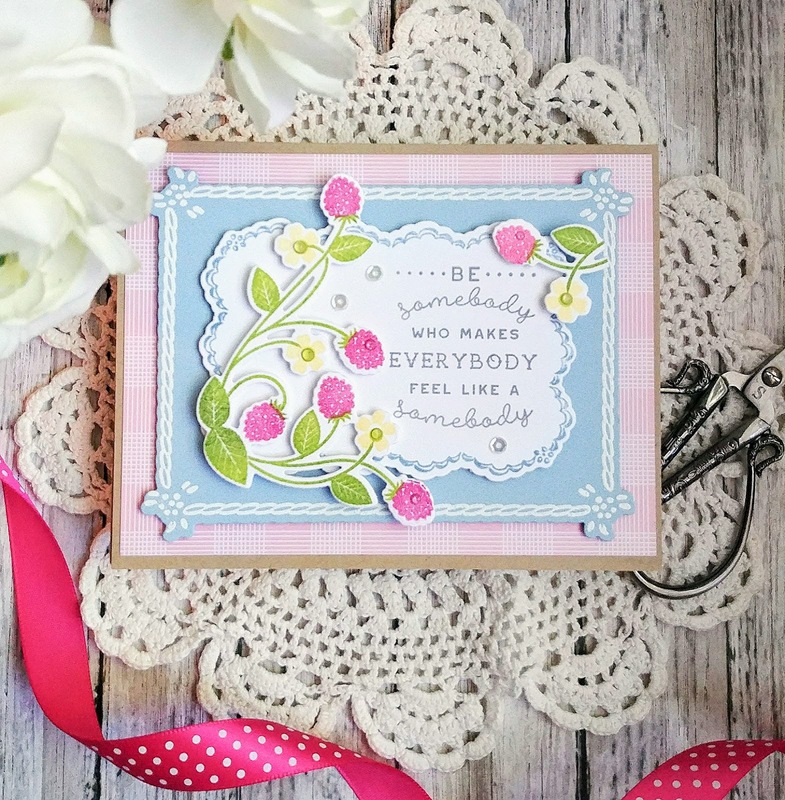 I've been itching to get this new Corner Adorner: June Mini Stamp set inky. I wasn't assigned this particular set for the release, but it has been calling my name! 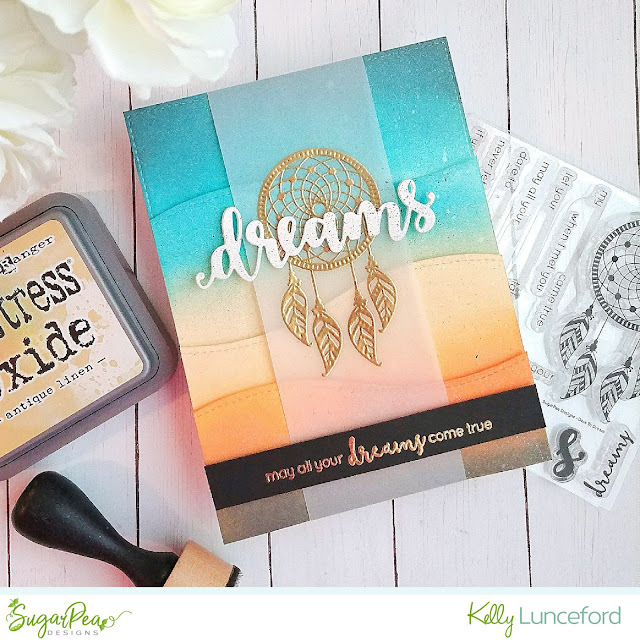 I was also thrilled to combine it with some previously released stamps and dies that I haven't had a chance to use yet. I have this "new" stamp set basket that I put everything into that I have recently purchased and then once I feel I have used it enough, it gets cataloged with the rest of my sets. My "new" pile was getting too large and so I took the opportunity to use some and I just love how they look together! Before I jump into the details of the card, I just want to get a little personal with you all for a minute! I want to share a really great experience I had yesterday evening. A group of my friends got together and put together plates of cookies, wrote our names and numbers inside an assortment of my handmade cards and went out to "meet our neighbors". There are so many houses that I have zero clue who lives there! It is not what a neighborhood should be like, in my opinion! When I made THIS project, there were a few of you who mentioned that you don't know your neighbors and what a good idea it was! I think in this day and age people just get wrapped up in themselves and we don't reach out like we should! It was SO much fun meeting all of these amazing people that live right by me! We all need each other, we need human connection in this age of texting, emailing, etc. Nothing can replace the one on one connections that we make with people that we can have a conversation with, see the smile in their eyes or perhaps the hidden sadness! We NEED each other! So....I would like to issue a challenge to you to go and meet (or take cookies and cards) to ONE person in your neighborhood that you don't know TODAY! I promise you won't regret it....I guarantee you that you will want to go out and do it again! To be honest, I'm not feeling the greatest....sore throat, cough, head congestion, etc. and I could have just skipped it, but guess what? I didn't think about how I felt the entire time. 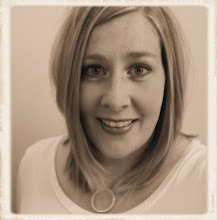 I came away feeling energized and happy...like the real kind of happy...the kind that lasts! As I came back into my neighborhood from picking my daughter up from dance, I saw one of the guys we met tonight and I was so happy to KNOW his name, to be able to say hello and he could say hello back because he knows who I am! Anyway, I'll get off my soap box, but the real reason I make cards is for reasons like this! 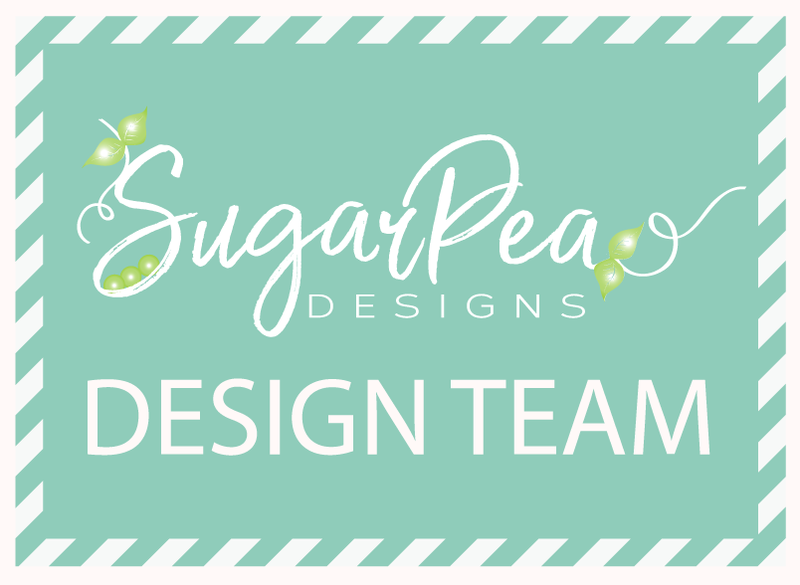 And before I forget....one of my friends took a hedgehog card I made for the latest SugarPea Designs release that I didn't share because I wasn't happy with it! Guess what? She took it with a plate of cookies to one of her neighbors. He LOVED it and he OWNS a hedgehog! SERIOUSLY??? I was blown away! But...I'll quit for now! LOL! Now...on to the card!!!! 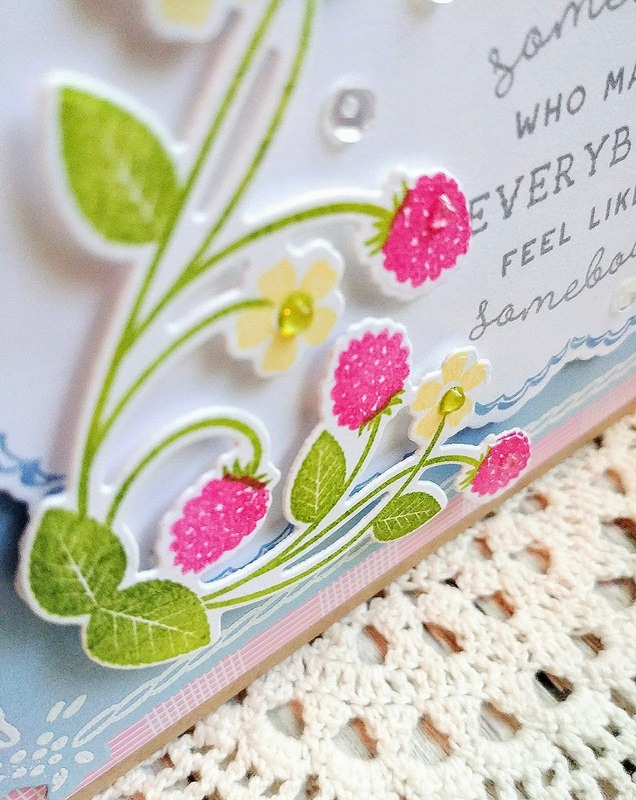 There are quite a few different stamping possibilities with this new Corner Adorner, but I chose to make raspberries. My raspberry plants are just starting to send out tiny little fruit that should be ripe in the next week or two! I can't wait! I wanted to make something fresh and summery for today's card. To begin, I stamped the leaf and vine portion of the image using two different green inks: Green Parakeet and New Leaf. I used my MISTI so that I could lay down the color gradually to get the shading that I wanted. At this point, I used the coordinating Corner Adorner: June die cuts. I wanted to make sure I stamped the flowers and fruit in just the right place and I needed the die cut piece as the guide. Once that was done, I added in the fruit using a combination of Raspberry Fizz and Hibiscus Burst inks. The flowers are stamped in Harvest Gold ink. 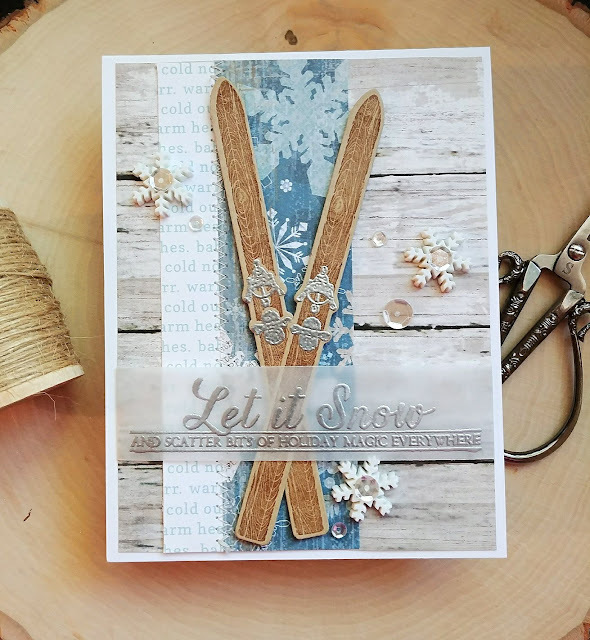 One of the new sets that I haven't used yet is the Stitch in Time: Borders stamp set. I thought it would be the perfect companion for these raspberries. 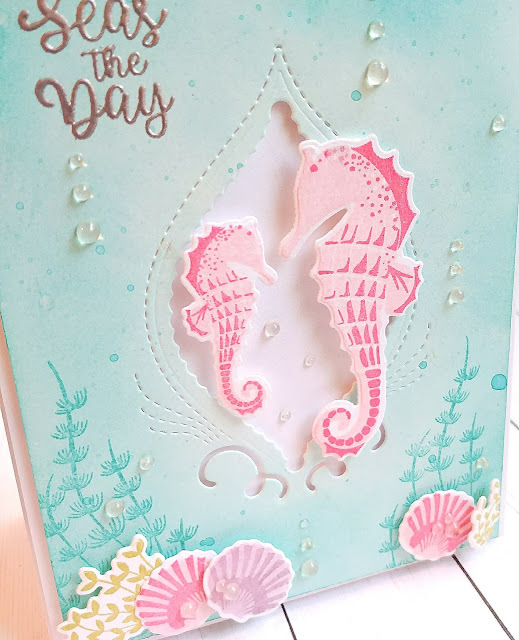 I stamped the larger border onto a piece of Spring Rain cardstock using Versamark ink and then used white embossing powder. 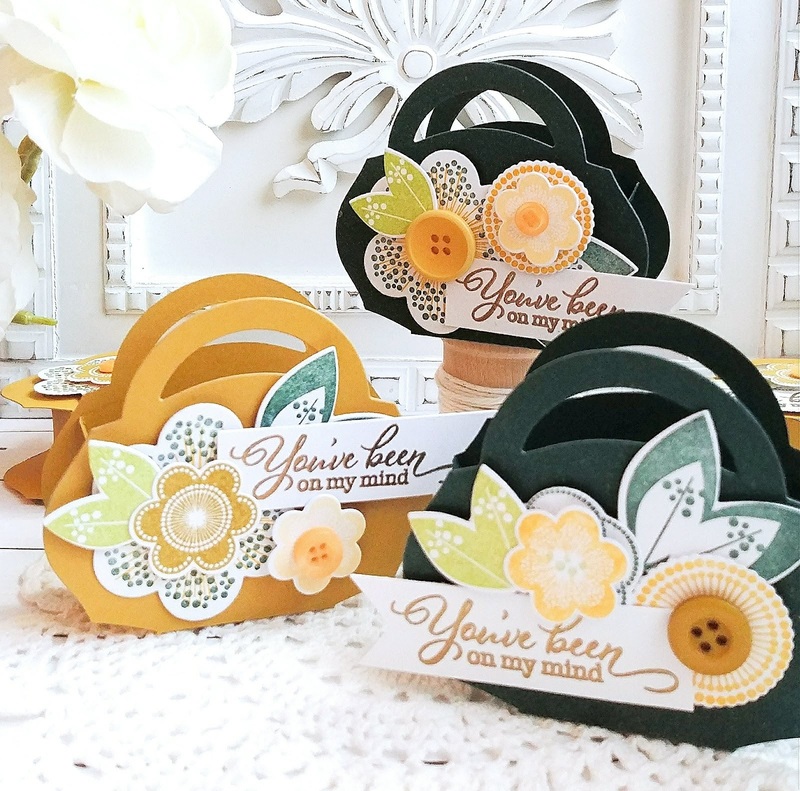 I used the coordinating Stitch in Time die cuts. I stamped one of the other images in Spring Rain ink onto a piece of white cardstock and used the dies to cut it out. 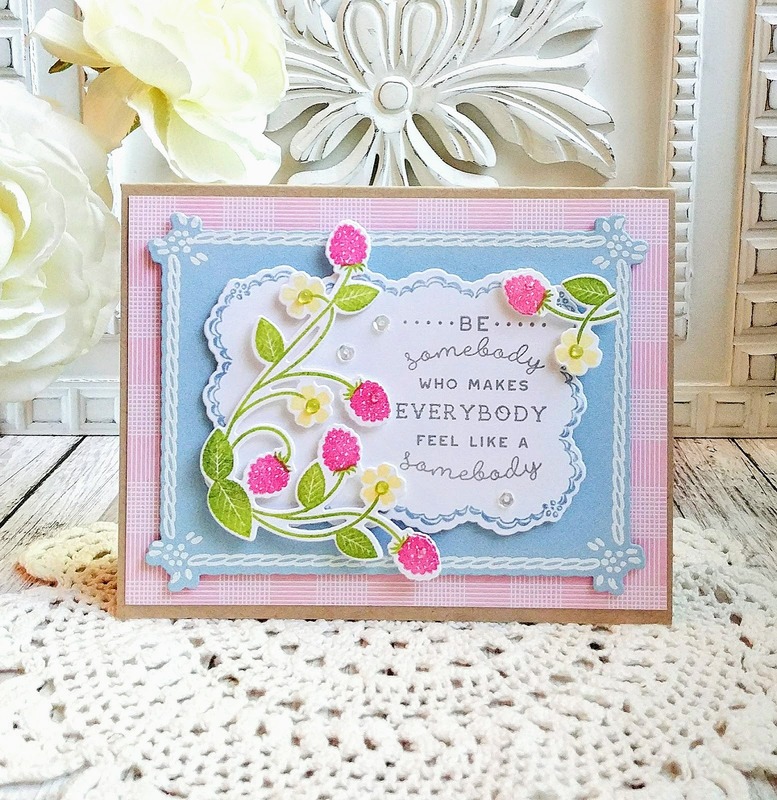 The sentiment is also one that I haven't used yet and is from the Kindness Counts set. This is one of those "must have" sets for me and I can't wait to use it even more! It fit perfectly into the space left over from where I placed the corner adorner. 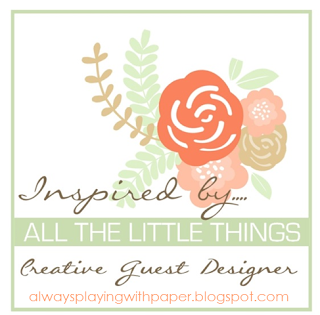 I layered everything up onto a piece of Pale Peony Bitty Big pattern paper. I just love the subtle detailing it adds to the card. I love how vintage and sweet this card turned out! The finishing touches are a few sequins and some clear Nuvo drops here and there to add some dew to the leaves and berries as well as the centers of the flowers! Thanks for fluttering by! P.S. If you DO go out and meet a neighbor, I'd love for you to leave a comment letting me know how it went! Hey friends! 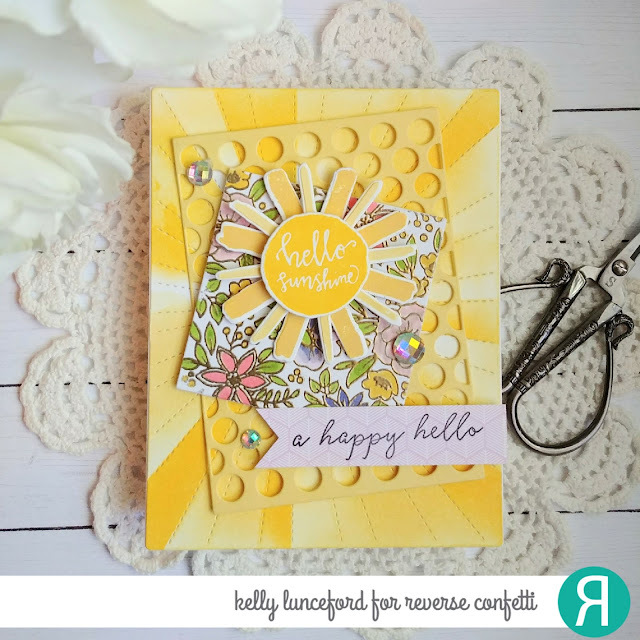 I'm over on the Reverse Confetti Blog today sharing this bright and cheery "hello" card for this week's Confetti Camera! 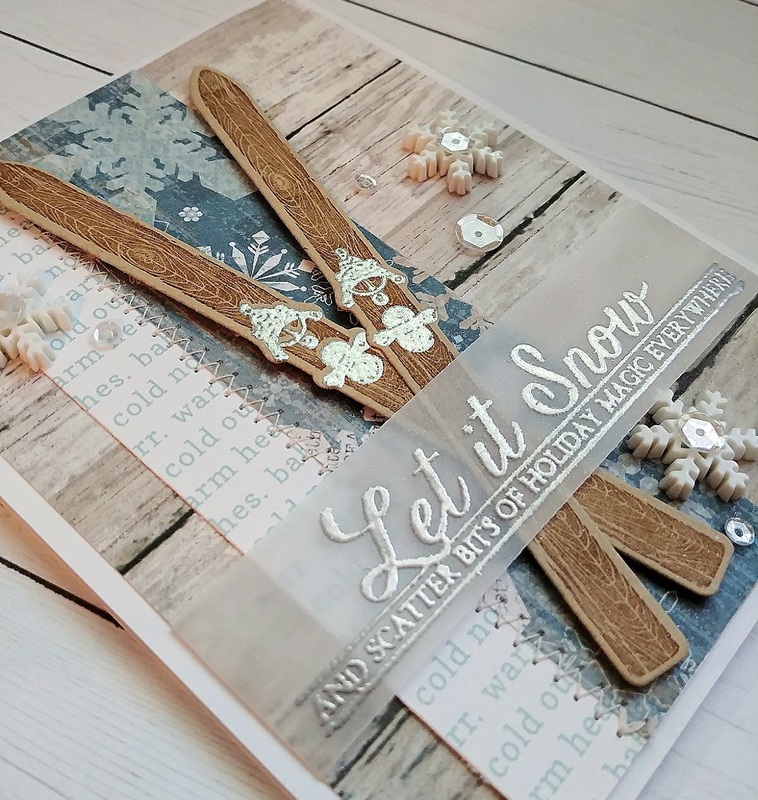 Each designer is asked to create a card using the 3-2-1 recipe which consists of: 3 different stamp sets, 2 stand alone dies, and 1 paper pad! Sounds like a fun recipe, right? You can read all about my card over on the Reverse Confetti Blog (linked above) but I do want to give a few tidbits and the supplies that I used! I definitely used and unexpected trio of stamp sets, but I love the results! 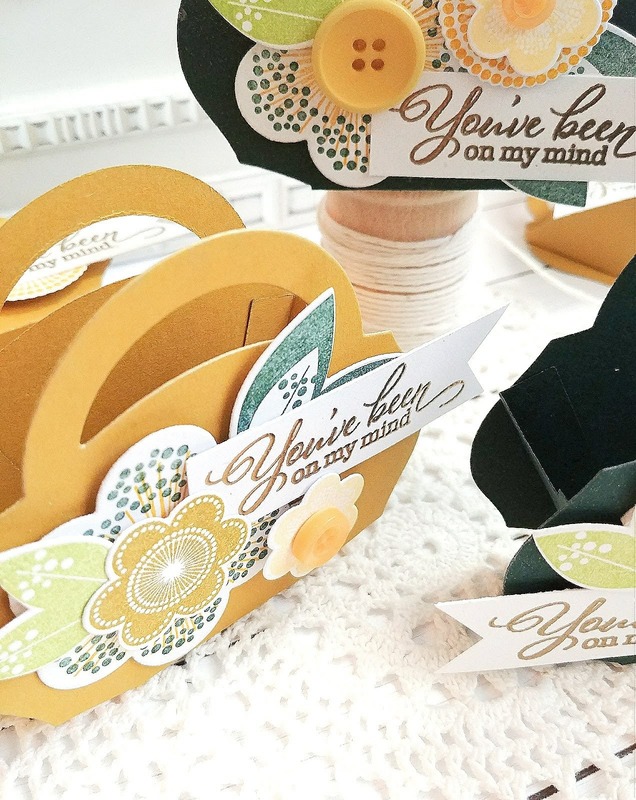 My 3 choices are Pattern Blocks, My Sunshine (and coordinating My Sunshine Confetti Cuts) , and Tall Blooms. 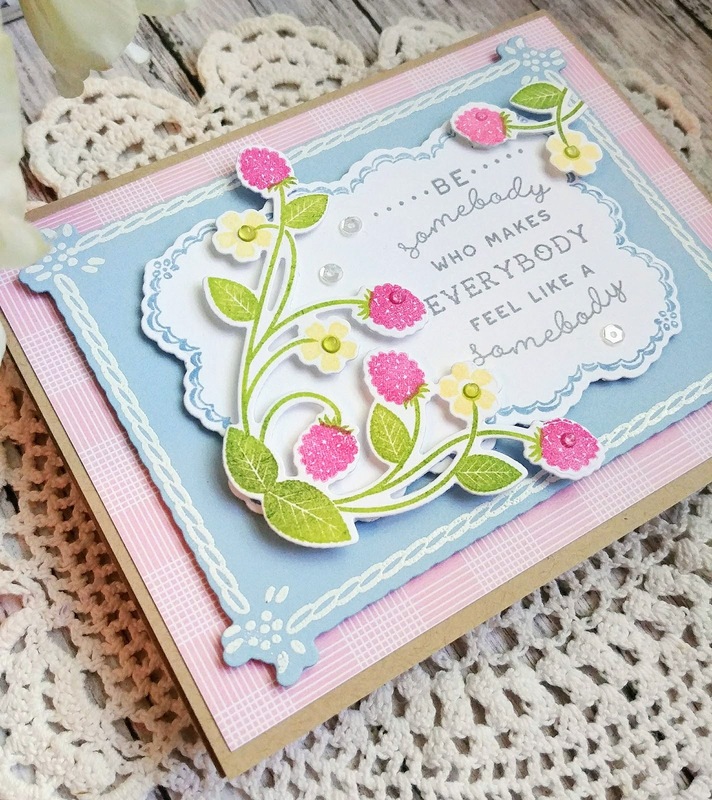 My 2 Stand alone die choices are the Stitched Rays Coverplate and the Polka Panel. The finishing touch is the sentiment strip stamped onto a piece of Fun Times pattern paper! 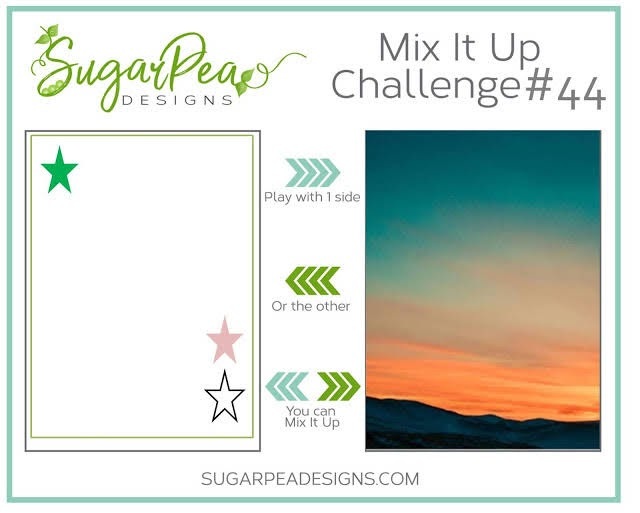 Mix it Up #44 May all your DREAMS come true! Hello! I'm super excited to be here today sharing my card with you for the current SugarPea Designs Mix it Up Challenge! It's always fun to get to create something with the newest release and that's just what I have done today!! I used the new Dare to Dream stamp set, which was fun because I didn't get a chance use the dream catcher image during the release. You can see what I made using this same set HERE. It probably won't surprise you that I had originally planned on using the new Stuck on You stamp set for today's card, but as it evolved, I really like the new direction it took! I knew that I would be using the photo as my direct inspiration, but I also had envisioned a layout using these curved pieces. These were going to be"resting" places for my pots of cacti/succulents. To begin, I die cut 3 curved pieces using the Card Front Element Builder as well as the top portion of the card. 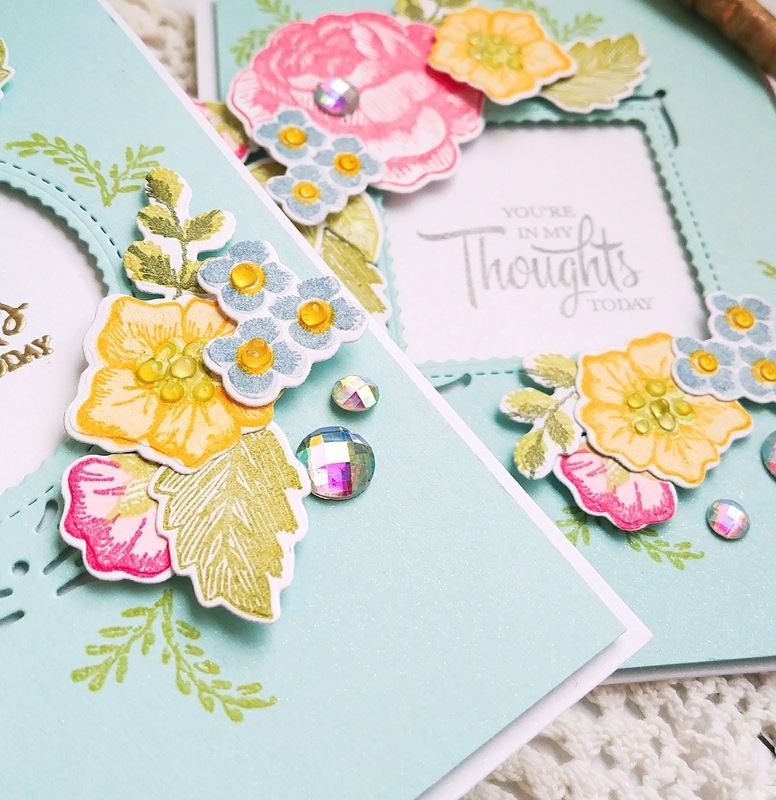 I wanted to keep the card cohesive with the subtle stitching lines that these dies add. After they were all cut, I got to work doing the ink blending; I used Spiced Marmalade, Antique Linen, Peacock Feathers, and Black Soot. I loved how nicely these colors looked to mimic the sunset in the photo. At this point, I didn't know exactly where I was headed; cacti? succulents? Llamas? Any of those would have worked, but then I remembered that I didn't use the dream catcher image. during the release. I decided that it would look really nice with these colors. I heat embossed it in gold onto a vertical strip of sheer vellum. This particular image doesn't have a coordinating SugarCut, so I had to think of a good way to use it without covering up the blended background. I think the vellum is perfect! 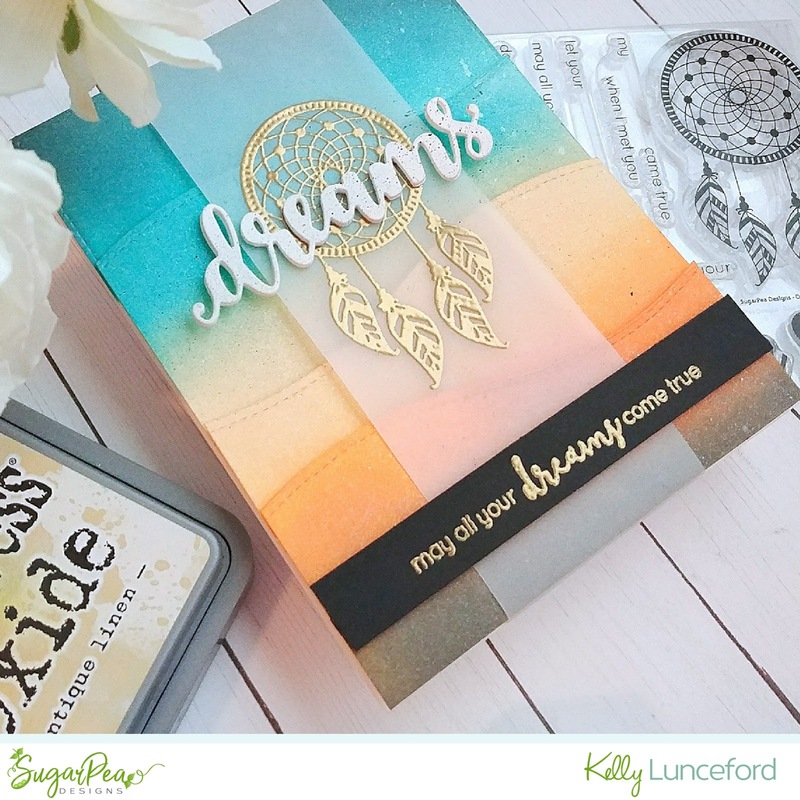 I also die cut the word "dreams" 4 times using the new Dreams SugarCut . I glued it together using liquid glue. I planned on embossing it in gold like I did on my card for the release, but as I put it against the background, I really liked how the white looked. I placed it just below the center of the dream catcher using liquid glue. 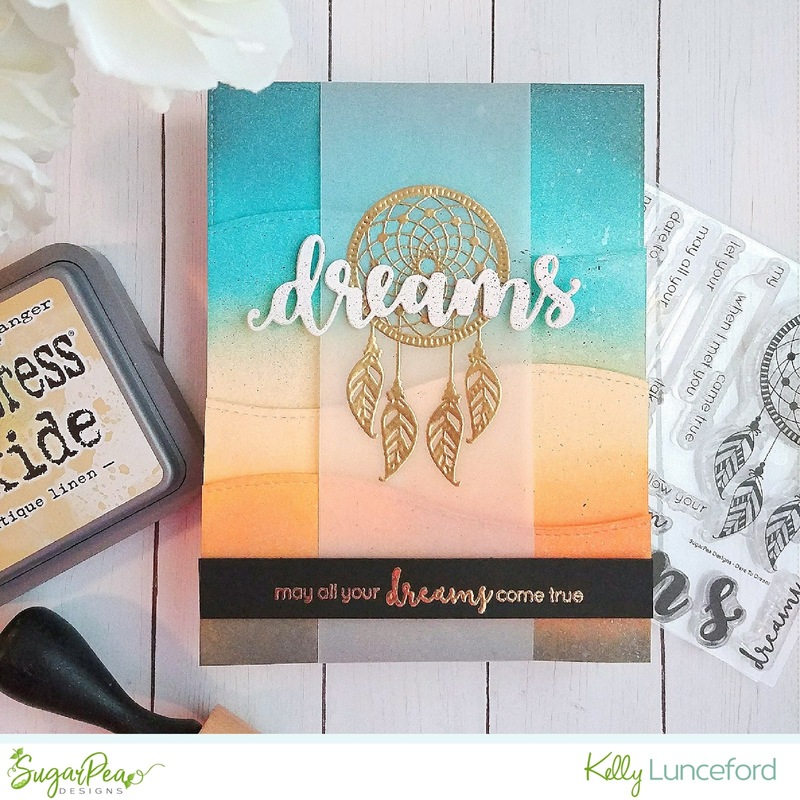 One of the fun parts of this stamp set it the different ways that you can mix and match the sentiments. I picked one that was only one line so that it could be added to a thin sentiment strip. It is heat embossed in gold onto a strip of black card stock. I contemplated tearing it like the black hills in the photo, but didn't take the time to experiment...i'm still wondering how that would have looked! Oh well! 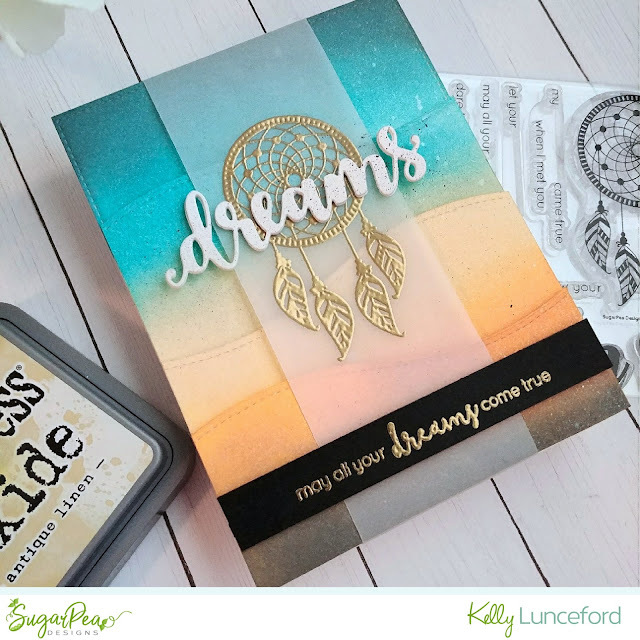 Once the card was all put together, I thought the word "dreams" was just a little too stark so I used my old Stampin' Up Color Spritzing Tool and a Black Stampin' Write marker and added some black flecks! I just love the subtle detail it adds to the card. I toyed around with adding some gold sequins in the pattern that the stars are placed on the challenge photo, but in the end I decided against them because I really like how it turned out without them. I was a little worried in the beginning that I was making something worthy of a southwest motel circa 1988, but I actually REALLY like it! That is why I love challenges so much because I always end up creating something that I would NEVER have made otherwise! I really hope you will join us! It's always so fun seeing your creations in the gallery! Thanks for fluttering by! Today is my 20th Wedding anniversary! Wow! I can't believe it has been that long! What an amazing ride it has been; good and bad, but still amazing and I'm so grateful to have my wonderful husband by my side and as a father to my children! 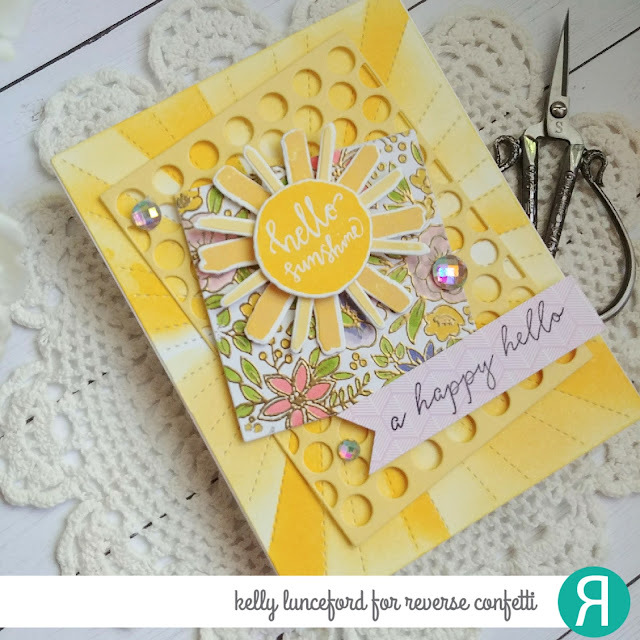 I'm over on the Precious Remembrance Shop Blog today sharing this bright, rainbow thank you card! I used the Little Things stamp set paired with the Thanks stamp set to create lots of fun rainbow details! 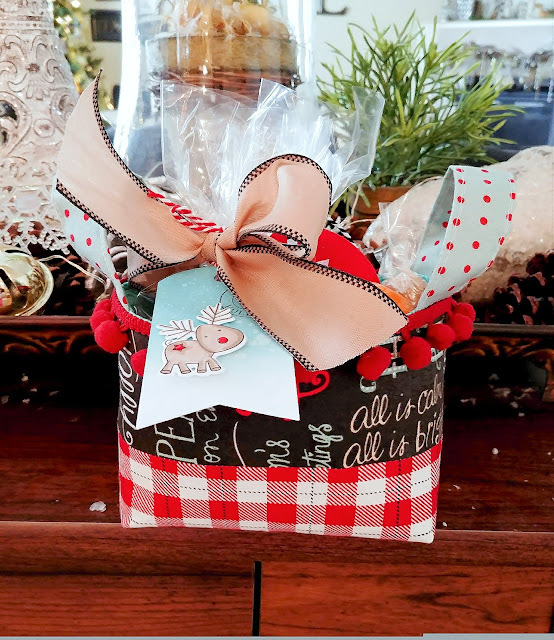 My MISTI came in handy for this design and was easy to create! This would be a perfect design to mass produce since the main layer has the majority of the stamping. I began with the green polka dot strip and worked my way up the card; flipped it upside down ans finished it that way. I was using my MISTI corner, so it was easier that way. 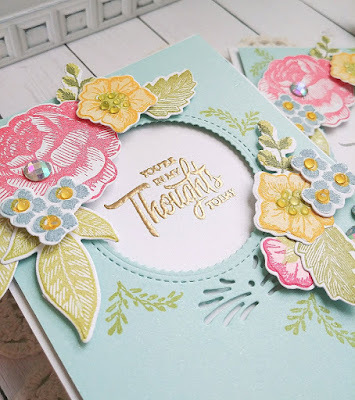 I stamped the "thank you for" portion onto a white square and added it to the card with foam squares. I thought it would be fun to check off the boxes with Nuvo drops in coordinating rainbow order.I also added a few buttons from the shop for some extra detail. Thanks for fluttering by!